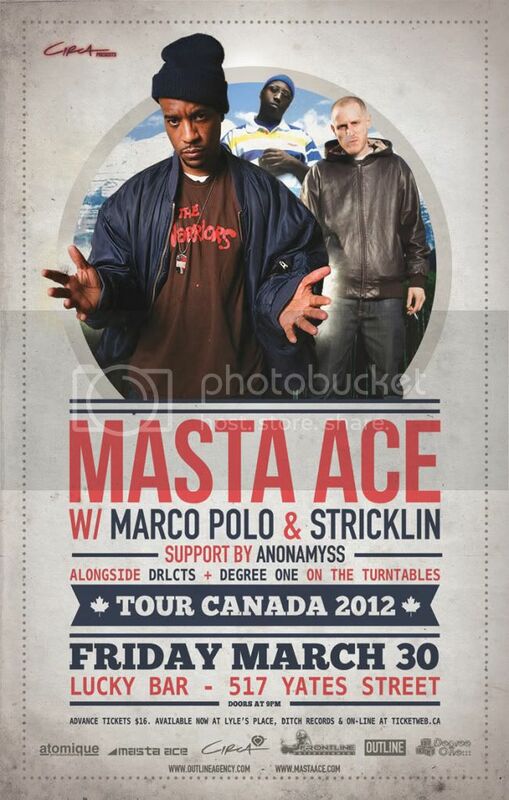 Degree One Events: MASTA ACE Live at Lucky Bar. MASTA ACE Live at Lucky Bar. w/ MARCO POLO & STRICKLIN. plus support from Anonamyss, DRLCTS and Degree One on the turntables. Limited amount of tickets available. Lucky is a small venue... get your tix asap. Facebook Event Page... RSVP and invite your friends..!! Masta Ace has always managed to remain current and totally classic in the exact same breath. I know it sounds impossible, but the truth must be told. As one of the most imaginative, narrative and prolific lyricists ever to emerge from the mean streets of Brooklyn USA, his albums are like mini-movies. As a matter of fact, the man has been born, and re born, and born yet again. In his 1988 lyrical debut he took a stand along side Big Daddy Kane, Kool G. Rap and Craig G on hip hop's most important posse cut, ‘The Symphony’. His first full length album, the Marley Marl produced Take A Look Around (1990), established the rookie emcee as a sophisticated voice from the ghetto. Slaughtahouse (1993) was an ingenious conversation with hip hop, as Ace and his incorporated crew took on the entire gangsta rap genre. In 1995, his Sittin' On Chrome LP unified American car culture as a celebration of rims and rides and rap music. Then after a 6 year hiatus, Ace caught the world off guard with the epic Disposable Arts (2001). This classic theme album, complete with plot, main characters and score, played like a feature film on wax. A Long Hot Summer, (2004), was the prequel to Disposable Arts. These two “flicks”, were connected, and although Ace was the only actual recurring character, the storylines blended together in a well thought out arrangement. "Coming off of Disposable, I knew I wanted to do another theme album," Ace admits. "I watched ‘Thunderbolt and Lightfoot’ with Clint Eastwood and Jeff Bridges. The whole side-kick movie thing was the original inspiration for that album.” In 2004 he announced that “…Summer” would be his fifth and final solo album. It seems that he was planning a unique and different way to continue making contributions to Hip Hop. Ace has teamed up with Wordsworth, Punchline and Stricklin to form the new group EMC. All three were featured heavily on his last two releases and the chemistry that resulted was undeniable. Ace mentions, “After touring together for the last 6 years, the group album became the natural evolution of our friendship.” The album will be released this summer on M3 Records, an upstart independent label formed by Ace and his partners “Filthy Rich” and “DJ Rob”. "I'm hoping that M3 thing is gonna be the next cool hip hop label," he says. "When you see the logo you're gonna expect quality music. Like back in the days when people saw the Cold Chillin' label they bought the record because they knew it was gonna be something hot. I hope to establish M3 with this new album.